Do you remember that feeling? This was well before cell phones and auto text wire messages announcing school cancellations. 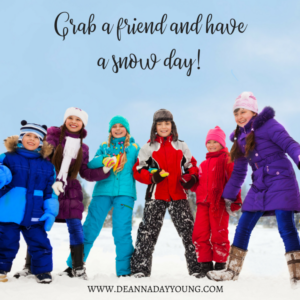 We would have the radio on two hours before school was to start just hoping we would hear our school name announced so we could stay in our PJs a little longer and then gather friends to play in the snow. Mom would bake cookies and we would have hot chocolate. We would stay out until our toes wouldn’t move and our fingers felt like they would break off. Then we would come in for a snack and a stint by the warm heater. Wet clothes would go in the dryer preparing to do it all over again! No pressure. Just baking, eating, laughing and playing in the snow. Oh how I long for a “snow day”! If snow emergencies are announced and we can’t travel to work, never fear, with today’s technology we can still work from home. Kids have their school-issued computer devices and homework is doled out from the comfort of the teacher’s couch. We can never get away. We just need a snow day. A day of no emails and cell phones. A day of fun with family and friends with no feelings of guilt. A day full of hot chocolate and homemade cookies. A day just sitting by the fire warming up to go play in the snow. Take time out during this busy season for a snow day – even if there is no snow. Grab a friend and a cup of hot cocoa and relax. Go ahead. Have a snow day. I double dog dare you! This entry was posted on December 21, 2017 with tags: #makeadifferenceeveryday, #snowday, christmas by Deanna Young.